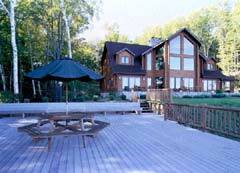 Trex Wood-Polymer� lumber that brings together some of the best properties of wood and plastic. Compared to conventional decking lumber, Trex decking offers so much more: outstanding durability without preservatives or sealants, workability that wood can't match, and an elegant natural coloring that stays looking great year after year. 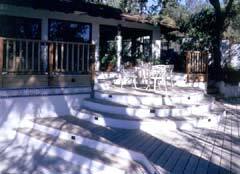 The Ultimate Easy-Care Decking Material! Structures using composite lumber like Trex decking have been standing up to the toughest environments for over ten years. To make Trex Wood Polymer lumber, approximately equal amounts of waste wood fiber and reclaimed plastic are combined. The wood fiber comes primarily from woodworking operations, while the plastic material is reclaimed mainly from stretch film and grocery sacks. During the "mixing" of these elements, the plastic actually surrounds and protects the individual wood fibers, giving Trex decking many of its superior weather-resistant properties. Trex decking contains no virgin wood or virgin plastics. No preservatives or treatments are added during its manufacture. In addition, Trex is completely recyclable after use through the Trex Recycling Program. 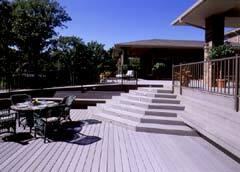 TREX Decking: For Outstanding Durability ! The combination of wood and plastic in Trex decking means it can stand up to anything Mother Nature dishes out!